The first collection of acclaimed illustrator Jack Unruh’s work, this book gathers the best of the illustrations he created for The Texanist, Texas Monthly’s back-page column, along with the serious and not-so-serious questions that inspired them. The Texanist, Texas Monthly’s perennially popular back-page column, has become the magazine’s most-read feature. With an inimitable style and an unassailable wholesomeness, columnist David Courtney has counseled many a well-intentioned Texan, native or wannabe, on how to properly conduct him- or herself. 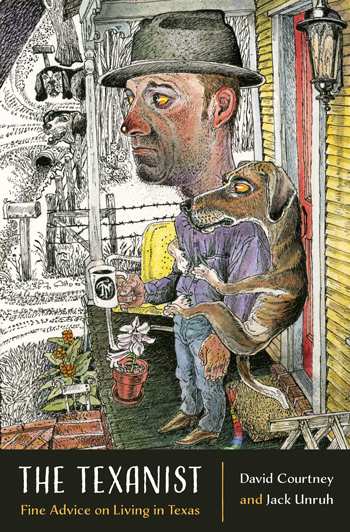 Until the July 2016 issue, an original illustration by the late award-winning artist Jack Unruh, depicting the Texanist in a situation described in the column, accompanied the Texanist’s sage wisdom. Unruh’s peerless illustrations displayed a sly wit that paired perfectly with Courtney’s humorous ripostes. The Texanist gathers several dozen of Unruh’s most unforgettable illustrations, along with the fascinating, perplexing, and even downright weird questions that inspired them. Curing the curious, exorcizing bedevilment, and orienting the disoriented, the Texanist advises on such things as: Is it wrong to wear your football team’s jersey to church? When out at a dancehall, do you need to stick with the one that brung ya? Is it real Tex-Mex if it’s served with a side of black beans? Can one have too many Texas-themed tattoos? The Texanist addresses all of these important subjects and more. Whether you heed the good guidance, or just enjoy the whimsical illustrations, The Texanist will both entertain and educate you. I have a co-worker who dips Copenhagen and spits into a Styrofoam cup in the office. Is this appropriate? If, when you visit a friend’s house, he has parked on his front yard, may you also park there? Is it really okay to make love in a campground? Can one have too many Texas-themed tattoos? What are the guidelines for male friends helping each other apply sunscreen? Is it okay to buy my daughter a homecoming mum and say it’s from a secret admirer? How old need a boy be to receive the gift of a first gun? What can I do to keep varmints from destroying my beautiful landscaping? Do I have to go with my family to take a bluebonnet photo this year? Will hiring a lawn service to do my yard work make me soft? Is it wrong to wear your football team’s jersey to church? Is it real Tex-Mex if it’s served with a side of black beans? How do I break into the business of ranching? When out at a dance hall, do I need to stick with the one that brung me? What do I tell my young son when he asks me to identify a roadside crop I don’t recognize? Can I have school spirit for a college I didn’t attend? How many Gulf oysters does it take for a person to see results from the aphrodisiac qualities that they are said to possess? May I pick the bluebonnets? What are the rules of the road when it comes to driving behind a tractor? If I hit a deer with my car, is it legal to collect it and eat it? Is there such thing as gravel-road etiquette, and if so, how best can I teach it to the neighbors? How do I get out of a wedding scheduled for Super Bowl Sunday? Is disciplining my niece over spilt Dublin Dr Pepper okay? Do country dancers ever go clockwise? Can I shoot a rattlesnake in my suburban backyard? May I keep a loose dog even if I have a pretty good idea where he came from? Is there a point at which I should stop condoning my daughter’s tomboy side? What are the rules regarding the setup of a new tailgating spot? Is it legal to be buried on my own property? Should I unleash my dogs on the possum that visits my back porch? If two ranches are separated by a length of old barbed-wire fencing and that fence needs repair, who is responsible come fence-mending time? Have rural Texans always been closed-minded about clothes? Why is driving allowed on beaches in Texas? Can you recommend a cure for cedar fever? Does anyone ever have an actual “roll” in the hay? Is there really “no such thing as bad barbecue”? Are the banks of a river free to use for camping? How is it possible that the word “Texan” is not accepted for play in the game Words With Friends? When did we start referring to a chicken’s “second joint” as its thigh? Tell us about your little sidekick? Instead of handing my pocketknife over to airport security, I used a service that promised to mail it back to me. I haven’t seen it since. Is it gone forever? Can you recommend other Texas beaches that compare with the old South Padre Island? What should I do if I encounter a tornado while driving? How should a Texan handle himself in the presence of a small stinging insect? I let my daughter use my husband’s chili pot to tie-dye some T-shirts, and he’s really upset. How do I make it right? Is not liking Willie Nelson’s music a relationship deal-breaker? My husband and I are Texans living in Florida, but recently he told someone that we were from Florida. Will you please explain to him why this cannot continue? What do I tell my friend who insists on giving Tennessee credit for the “birth of Texas”? I’ve been thinking about getting a license to carry a gun, but my wife insists this is a bad idea. I seek your counsel. My wife-to-be loves animals and wants a miniature Vietnamese potbellied pig as a wedding gift. Is this insane? Courtney joined Texas Monthly in 2005 and has written The Texanist since 2007. He has also contributed to features such as the annual Bum Steer Awards, the quinquennial review of the fifty best barbecue joints in Texas, “The Great Terquasquicentennial Road Trip,” “The 50 Greatest Hamburgers in Texas,” “The 40 Best Small-Town Cafes,” as well as “Snap Judgment” (a compilation of the ten greatest plays in Texas college football history) and “The Texanist’s Parenting Quiz,” among others. Unruh was an award-winning illustrator whose art was featured in numerous publications, including Entertainment Weekly, Rolling Stone, Atlantic Monthly, Time, Sports Illustrated, Readers Digest, New York Magazine, National Geographic, Sports Afield, Field and Stream, and GQ. His work was included in Communication Arts Illustration Annual since its inception and also appeared in numerous issues of American Illustration, Graphis, AIGA, and Print.